Drug abuse consistently ranks high among adults’ top health concerns for children in the United States. Recently, misuse of prescription stimulant medications as “study drugs” has been gaining public attention. “Study drugs” usually refer to the types of stimulant medications or amphetamines typically prescribed for the treatment of attention deficit hyperactivity disorder (ADHD); commonly prescribed medicines in this category include Adderall, Concerta, Ritalin, and Vyvanse. Sometimes students without ADHD take someone else’s stimulant medication, to try to stay awake or try to improve their scores on exams or assignments. Although taking unprescribed “study drugs” has not been shown to improve students’ grades, the 2012 Monitoring the Future study found that 12% of high school seniors and 10% of sophomores reported having used Adderall, Ritalin, or another stimulant or amphetamine without a prescription at least once. To examine parents’ awareness about this emerging issue, in January 2013 the C.S. Mott Children’s Hospital National Poll on Children’s Health asked a national sample of parents about their teens’ use of “study drugs” and their level of concern about the misuse of “study drugs” in their communities. Among parents of teens 13 to 17 years old, 11% say their teens have been prescribed a stimulant medication for ADHD in the past. Among parents of 13- to 17-year-olds who have not been prescribed such medicines, 1 in 100 say their teens have used a “study drug” to stay awake to study for an exam or to do homework (Figure 1). In this same group, 4% of parents report that they “don’t know” if their teens use “study drugs” and 95% say that their teens have never misused these medications. One-half of the parents surveyed say they are “very concerned” about children and teens in their communities using “study drugs” to do well on exams or homework. White parents are most likely to say they are “very concerned” (54%), compared with black (38%) and Hispanic/Latino (37%) parents. Only one-quarter (27%) of parents of teens in this survey report they have talked with their teens about using “study drugs.” Black parents are more likely to have discussed this issue with their teens (41%), compared with white (27%) or Hispanic (17%) parents. Over three-quarters of parents support school policies aimed at stopping abuse of “study drugs” in middle schools and high schools. Overall, 76% of parents believe schools should be required to discuss the dangers of ADHD medication abuse. In addition, 79% support a policy to require students with a prescription for ADHD medications to keep their pills in a secure location such as the school nurse’s office—a requirement that would prohibit students from carrying stimulant medicines that could potentially be shared with, or sold to, other students. Only 1 in 100 parents believe their teens have used “study drugs,” while recent studies report 1 in 10 10th-graders and 1 in 8 12th-graders have used these drugs. 50% of all parents say they are “very concerned” about teens using “study drugs” in their communities. Over three-quarters of parents support school policies aimed at stopping abuse of “study drugs” in middle and high schools. Abuse of prescription stimulant medicines can be dangerous for teens—leading to problems such as acute exhaustion and abnormal heart rhythms, and even confusion and psychosis if teens are addicted and go into withdrawal. In some cases, misuse of stimulant medicines has been associated with other risky behaviors such as unsafe sexual activity and gambling that can lead to other problems for teens. We found in this poll that parents’ awareness of their teens using “study drugs” does not match self-reported use by teens. 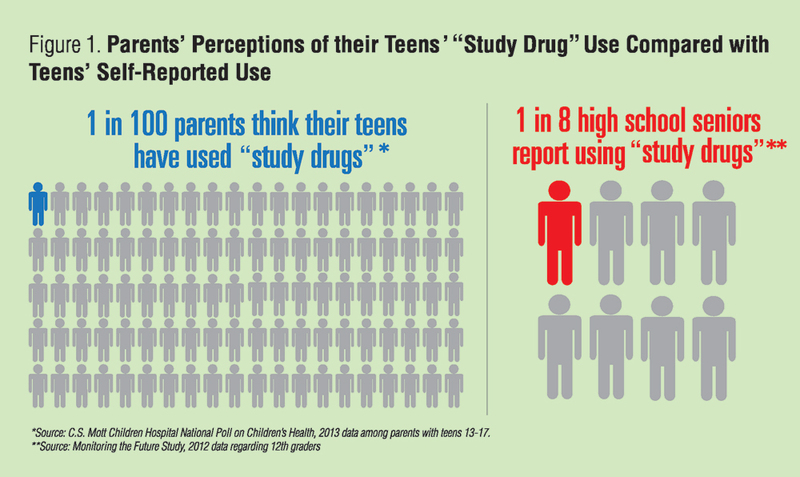 Recent national data from Monitoring the Future indicate that 10% of high school sophomores and 12% of high school seniors use “study drugs,” but only 1% of parents of high school-age teens believe their kids are misusing someone else’s prescription stimulants. This disconnect—which we have found before, related to teen substance use—may be worsened by the more subtle effects of “study drugs” compared with illicit drugs like heroin and cocaine. In addition, teens who abuse “study drugs” may be those not traditionally at risk for other drug abuse. Monitoring the Future found in 2012 that rates of “study drug” use for white high school students were nearly twice as high as for Hispanic/Latino students and three times as high as for black students. In this poll, white parents had higher levels of concern, but were less likely to talk with their teens about “study drugs,” compared with black and Hispanic parents. The high level of concern reported by parents about teens in their communities using “study drugs,” and the strong support for school policies aimed at stopping abuse of “study drugs” in schools, underscore the need for greater communication among public health officials, schools, parents, and teens regarding this issue. It's finals week: Do you know what your teen is taking to study so hard? This report presents findings from a nationally representative household survey conducted exclusively by GfK Custom Research, LLC (GfK), for C.S. Mott Children’s Hospital via a method used in many published studies. The survey was administered in January 2013 to a randomly selected, stratified group of parents with a child age 13-17 (n=710) from GfK’s web-enabled KnowledgePanel® that closely resembles the U.S. population. The sample was subsequently weighted to reflect population figures from the Census Bureau. The survey completion rate was 57% among the panel members contacted to participate. The margin of error is ± 1 to 5 percentage points and higher among subgroups. Davis MM, Kauffman Ad, Singer DC, Gebremariam A, Clark SJ. One in ten teens using "study drugs," but are parents paying attention? C.S. Mott Children's Hospital National Poll on Children's Health, University of Michigan. Vol 18, Issue 3, May 2013. Available at: http://mottpoll.org/reports-surveys/one-ten-teens-using-%E2%80%9Cstudy-drugs%E2%80%9D-are-parents-paying-attention. Parents say, "Other teens drink and use marijuana, but my kids don't"